OH!!! The FEEELS!! !...What is this coming out of my eyes, this salty, clear fluid!!!?? Excuse me for a moment....Talk amongst yourselves, I'll be right back!! 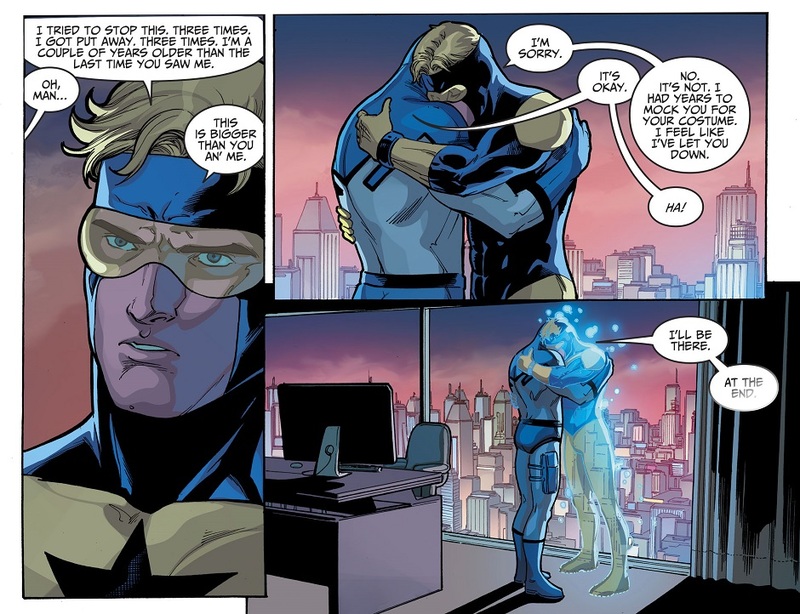 I don't think it became clear until we could look back on it with the benefit of time and perspective, but the death of Ted Kord might be the most emotionally significant moment of the last fifteen years from the major publishers. 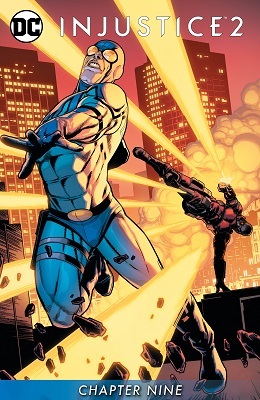 It's one of the most unique deaths in comics for them choosing to have the aftermath hold weight, and still hold weight. Goddammit, how can a series based on a frigging video game be so good and draw so much emotion from me??? Because character driven stories are the best stories. Whatever the surrounding events are, the love between these two men: Michael's desperation, resolve, and regret. Ted's bravery in the face of what is -literally- certain death. We can relate to these much more than we connect with superheroic despotism or whatever else is going on. Quick question though, is Ra's killing them because their companies actually were polluting the environment, or were they actually helping humanity, but Ra's views that as a worse crime since humanity is the problem to him? 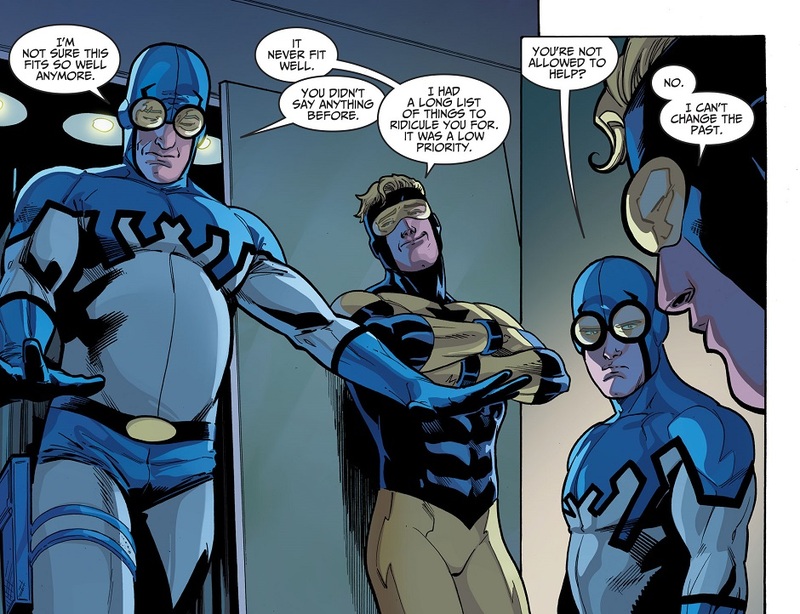 Since it is almost impossible for Ted Kord to willingly do something harmful to the planet, either his company's filled with scuzbags, or Ra's is doing what Poison Ivy did in that episode of B:TAS, and not bothering to do a lick of fact-checking before going around murderising people. Ain't no curse big enough for him. 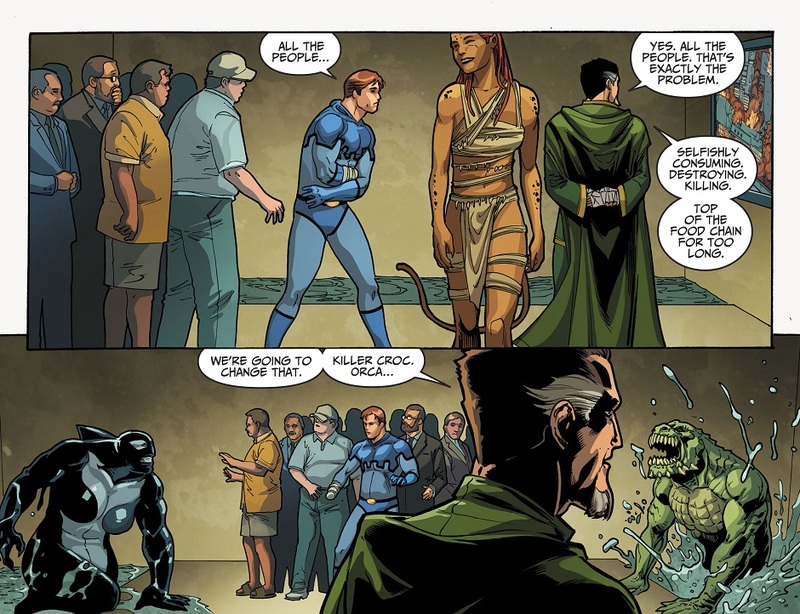 ... also, this writing is way better than this comic deserves. Wow, Katana alone should be enough to bring in Ted but they had to have her, the League of Assassins and whoever the other two guys were do the job. 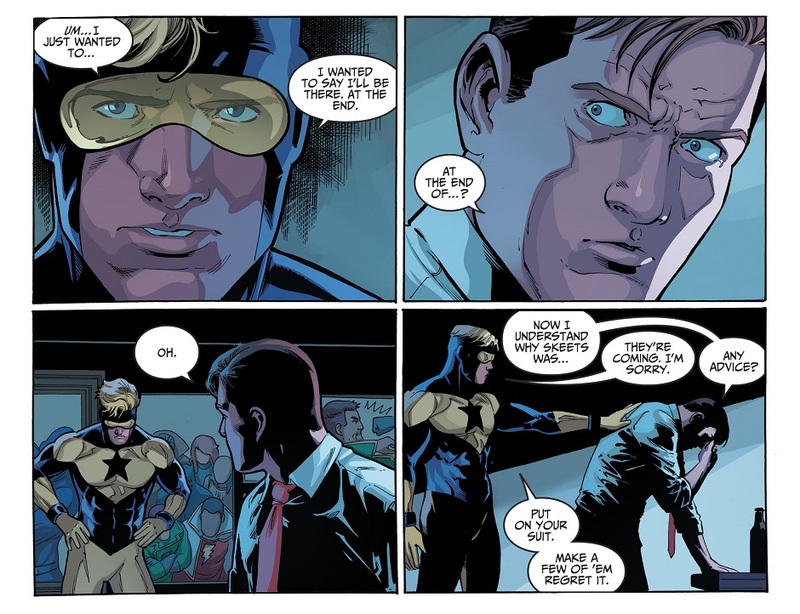 For a character who a lot of people think is a joke (both in and out of the DCU), Ted Kord is the epitome of "Do not go gentle into that good night". It's not enough to send someone who can beat him, after all, they have to make sure he doesn't *get away*, and Ted could get away from quite a lot. As far as Ted Deaths go, it's at least mostly good-natured jabbing between Ted and Mike, and... well, it's not even subtext by the end, it's just text. 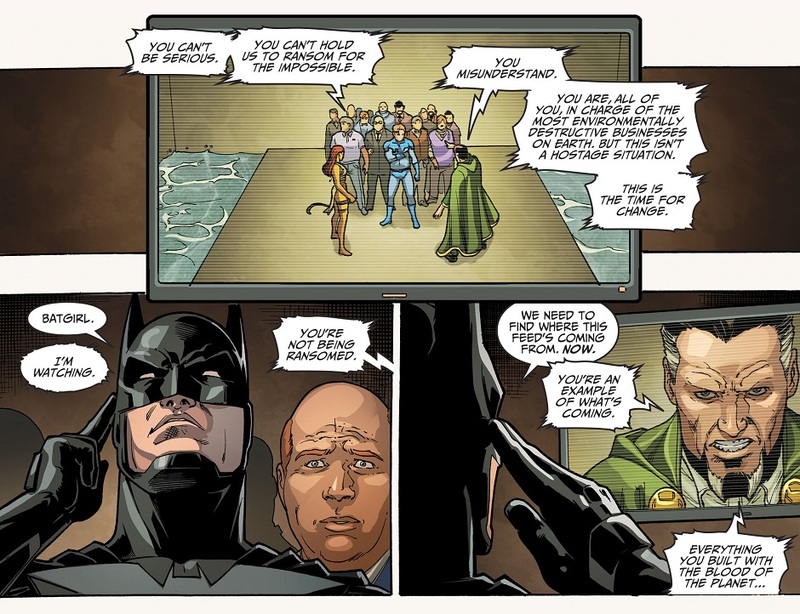 Better than how Prelude to Infinite Crisis treated him, at least. 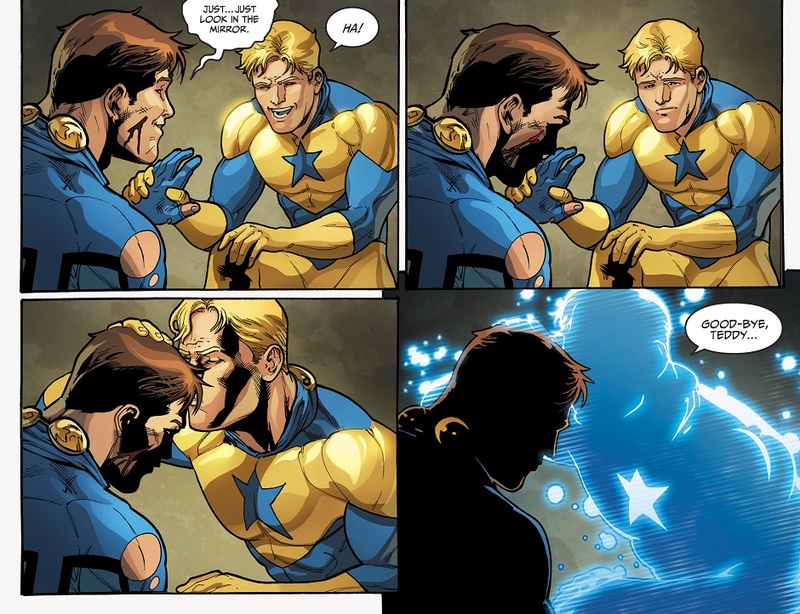 Beetle and Booster were a big, big reason I started reading US comics...this...this gets me right where it hurts. 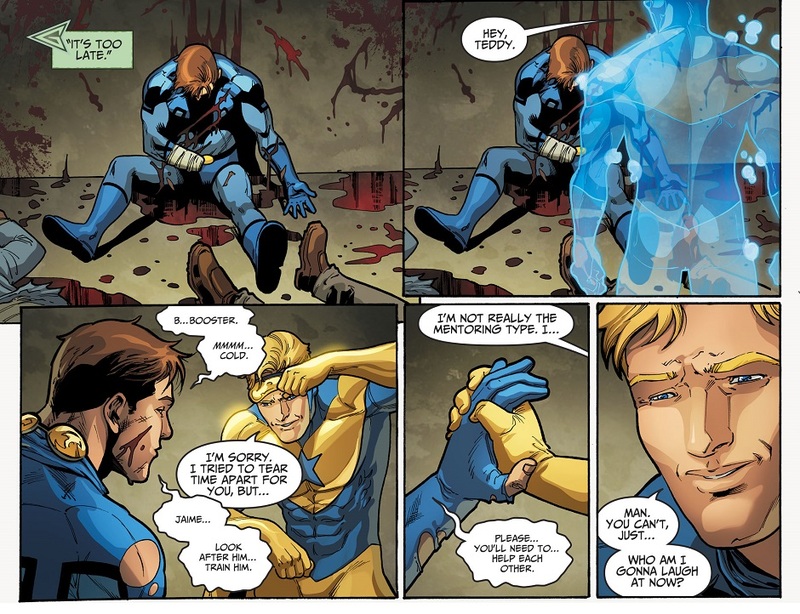 I'm still not over the pre-Nu52 death of Ted Kord, and now I've got to get used to it all over again?! 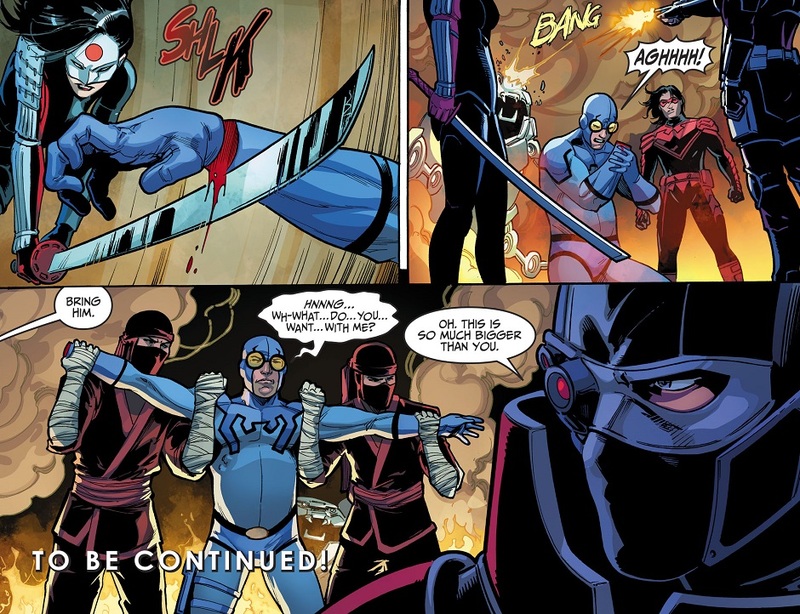 Have they explained yet why Katana is evil yet? It just seems so out of place but then this is the Injustice Universe. *ugly gross sobbing* T-t-the ship li-i-i-ives! Also is it just me, or does Ted go from "noticeably paunchy" to "reasonably toned, for a non-superhero/athlete/celebrity-type" in these panels? He found his Spanx off-panel. Soo... Boostle confirmed? At least in this reality?